It sure wasn’t a pretty game, but no one can say it wasn’t hard-fought. The once left-for-dead Kansas City Chiefs beat the San Diego Chargers 23-20 in overtime in a weird and sloppy contest on Monday night. Each team managed to turn over the ball four times — most crucially by the Chargers on a fumbled snap that denied them the chance to kick a potential game-winning field goal. But not all the fireworks were defensive. The “counter trey” (sometimes also known as the “counter gap”) was made famous by Joe Gibbs’ Washington Redskins teams of the 1980s. Gibbs admitted, however, that (like most football coaches) he hadn’t invented the play; it came from watching tapes of Tom Osborne’s great Nebraska teams from the 1970s and ’80s. And Chiefs coach Todd Haley has taken it and used it since. On the play, the play-side blockers to the offense’s right block “down” to create a sealed wall for the running back, leaving the play-side end player for the Chargers (Travis LaBoy) and the “linebacker” to the play-side (in this case, strong safety Steve Gregory). To block the end man on the line, the backside guard, Ryan Lilja, pulls and “kicks out” LaBoy to create a running lane. With LaBoy sealed and out of the picture, the running lane develops. 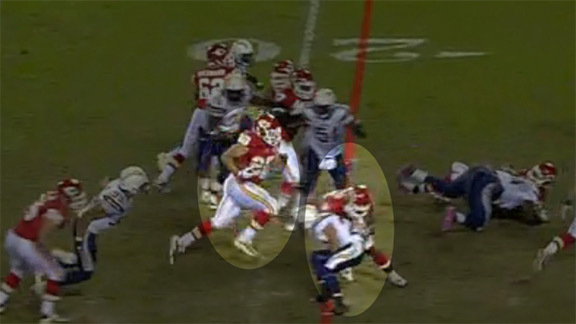 The fullback is the second blocker through and is responsible for Gregory. Meanwhile the running back, Battle, takes a “counter step” to his left, accepts the handoff, and arcs to his right to follow his block. Battle’s job is to make his blocker correct by cutting away from the defender. 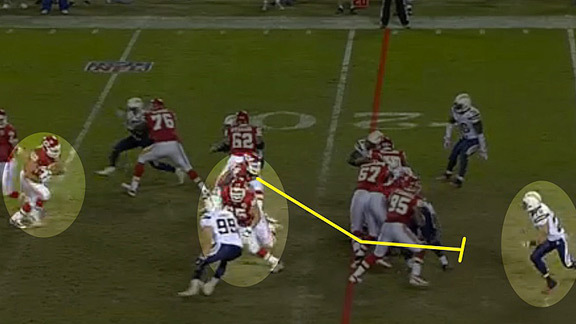 As the image above shows, Gregory has tried to attack the outside and has been sealed off as well, and so Battle cuts vertically looking for a crease in the defense, which he finds, with the result being a huge play for the Chiefs to set up a touchdown.